Vikings Corner: How could the Vikings approach a defensive line rotation in 2018? How could the Vikings approach a defensive line rotation in 2018? The Vikings' pass rush slowly declined as the season progressed, but why? Daniel House identifies a few potential reasons and looks at how the team could approach a defensive line rotation in 2018. Updated: June 8, 2018, 1:45 p.m. The Vikings have built their defense around rushing the passer and creating disruptions. With edge talent like Everson Griffen and Danielle Hunter and Linval Joseph inside, offensive line units face a big task when trying to handle the top-tier options the Vikings have available. Throughout the 2017 season, teams were frequently chipping with tight ends to help against Griffen, who had ten sacks by the midway point of the season. However, as the year progressed, the Vikings’ pass rush started to slowly decline. In Weeks 5 through 8, the team was averaging more than 3 sacks per game. 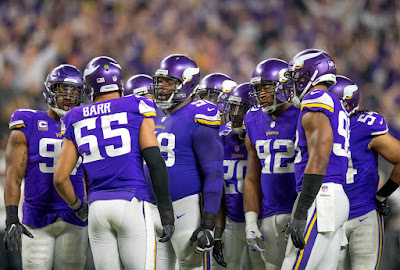 The number gradually tailed off as the Vikings entered each quarter of the season. During the final four weeks of 2017, Minnesota averaged roughly 1.5 sacks per game and had just three total quarterback takedowns during the playoffs. So what led to the sudden decline in production from the defensive line in 2017? First, Everson Griffen suffered a plantar fascia injury in Week 8, which drastically impacted his performance down the stretch. It was clearly difficult for him to drive and plant off his foot to get leverage. Not only that, but the snap counts for Griffen were really high early in the season. In six of the first eight games, Griffen was on the field for 85 percent or more of the total defensive snaps. Mike Zimmer even discussed how the team could have rotated the defensive line better last year. This year, the team must find a few young contributors to rotate into the mix and take away snaps from the top-three defensive ends. Between Stephen Weatherly, Tashawn Bower and Ifeadi Odenigbo, the coaches need two players who can contribute. The team might also consider moving Jalyn Holmes to defensive end in special sub-packages. When you look at how teams like the Eagles rotate defensive linemen, one notices the importance of having at least four defensive ends that can share work. As the year progressed, the Philadelphia pass rush continually improved and they looked fresh when they needed most. In the list below, you’ll see all of the contributions they received from players lower on the depth chart in 2017. It’s not just Philadelphia that followed a similar formula. In 2017, the Panthers notched the third-most sacks (50) and rotated frequently at defensive end. Each of the two teams discussed in this article had just one defensive end who played more than 60 percent of the total defensive snaps. With that in mind, the Vikings must find ways to rush the passer by rotating Danielle Hunter and Everson Griffen frequently. It doesn’t mean they can’t shoulder a high volume of snaps in certain situations, but it should be monitored closely. At defensive tackle, the team relied upon 32-year-old Tom Johnson to play a high volume of snaps. He played in 67.6 percent of the Vikings’ total defensive snaps as the team scratched and clawed for depth inside. Overall, the Vikings were really top-heavy in terms of snap distributions for interior defensive linemen. As you can see below, outside of Shamar Stephen providing rest from time to time, the Vikings didn’t have many players rotating inside, especially at the fourth defensive tackle spot. The team signed Sheldon Richardson in free agency to fill a major void at three-technique defensive tackle. His gifted ability and age provide a significant upgrade over Tom Johnson, who played far too many snaps last year. Richardson is a top-tier quality player, who the coaches can justify playing a high volume of snaps. As I noted in a recent piece, the move will also provide favorable opportunities for the defensive ends because Richardson and Linval Joseph will command so much attention. In comparison to other teams, the strategy varies for how teams handle an interior rotation. The Eagles had one of the most diverse approaches in the entire league. Most teams have at least two players at defensive tackle who eclipse 50 percent of the total defensive snaps. As you can see below, the Eagles had two defensive tackles in the 40 percent threshold last year. It was a major luxury for them to have three capable players at the top of the depth chart. Not every team follows this strategy, but there’s no questioning what it can do for preserving players as the season progresses. However, many successful teams play their top two interior defensive tackles for more than 65 percent of the total snaps. For example, the Panthers emphasized a defensive end rotation, but didn’t make the interior as much of a priority. The Vikings can follow a similar rotation, but they need to receive more consistent contributions from the third and fourth defensive tackles on the depth chart. Perhaps the Vikings will now rotate Jaleel Johnson between three-technique and nose tackle. They also recently signed David Parry, a former starter for the Colts. He could provide much-needed rest at the nose tackle spot. Parry has to fight to make the roster, but could if the team isn’t comfortable having fourth round pick Jalyn Holmes and Jaleel Johnson as reserves. More importantly, they are both inexperienced and project better as pure three-technique defensive tackles. Overall, the addition of Sheldon Richardson should help the overall performance inside. It’s not to say the snap counts shouldn’t be monitored, but the idea of replacing a veteran player with a high-caliber option like Richardson is a major lift. There’s no questioning the need to find an improved rotation at defensive end, especially in the lower portions of the depth chart. The Vikings have a few models they could follow to improve the performance and longevity of the defensive line. Time will tell how Mike Zimmer and the defensive staff approach a rotation, but it’s clear they’ve identified the need for a new strategy in 2018. The snap count for Shamar is why I was hoping the team would let him walk. He appears to have already hit the ceiling. I'm hoping Weatherly comes through this year, development time is really over for him, now he needs to play.